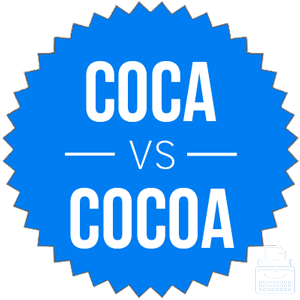 Home » Coca vs. Cocoa – What’s the Difference? When you need something to warm you up on a cold day, do you choose a creamy chocolate beverage or an illegal drug? Regardless of the choices you make in your personal life, you need to know the difference between coca and cocoa in your writing. One refers to a product derived from a cacao plant, while the other is a plant used to make cocaine. Clearly, this is not a mistake you want to make in professional correspondence. What is the Difference Between Coca and Cocoa? In this article, I will compare cocoa vs. coca. I will use each of these words in at least one example sentence, so you can see how they appear in context. Plus, I will show you a helpful memory tool that will allow you to choose either cocoa or coca correctly each time. What does cocoa mean? Cocoa is a noun that has two meanings. One of these meanings is a creamy chocolate-flavored drink. The other meaning is the powder used to make such drinks. Cocoa powder comes from cacao beans, which grow on cacao plants. Despite the confusing spelling similarities, the plant and its beans are always cacao plants, never cocoa plants. Some trendy establishments might use cacao to refer to their drinks in a misguided attempt at authenticity, but this usage is nonstandard. Marge made herself a mug of hot cocoa when she finished shoveling the fresh snow out of her driveway. One of the ingredients in my chocolate sheet cake recipe is Hershey’s cocoa, which says “100% cacao” on the label. If you are a fan of chocolate, you are a fan of cocoa but not necessarily a fan of coca. What does coca mean? Coca refers to four plants native to South America that are used to make cocaine. These plants are different from the cacao plant used to make cocoa. Interestingly, the soft drink Coca-Cola contained coca products until the early 20th century. Today, though, cocaine is illegal almost everywhere. Still, it is often used recreationally, despite being a dangerous stimulant with serious health effects. Most cocaine is manufactured in South America and smuggled to other parts of the world, especially North America and Europe. Native South Americans have used the leaves of the coca plant as a stimulant since ancient times. According to some reports, coca plants are being grown in southern Mexico to be used in the drug trade. Use cocoa to refer to a delicious drink or a powder made from cacao beans. Use coca to refer to the leaves of the plants used to manufacture cocaine. Coca vs. Cocoa Check: Since coca is part of the word cocaine, it should be simple to remember that coca plants are used to make this dangerous drug. Is it coca or cocoa? While these spellings are quite similar, they refer to very different things. Cocoa refers to a powder made from cacao beans, or to a drink made with this powder. Coca refers to plants that are used to make cocaine. The plants that grow cacao beans are not the same plants used to make cocaine. When you need a warm relaxing drink before bedtime, choose cocoa, not the stimulant drug cocaine. 1 What is the Difference Between Coca and Cocoa?